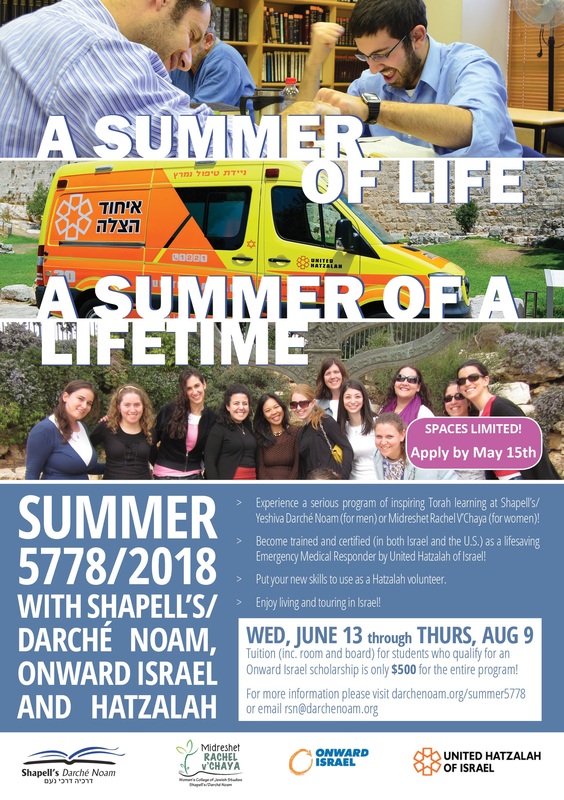 Shapell’s/Yeshiva Darche Noam and Midreshet Rachel v’Chaya are excited to announce their upcoming, “Summer of Life- Summer of a Lifetime!” Students will participate in our regular program of Torah learning and inspiring trips- followed by being trained as Emergency Medical Responders by United Hatzalah of Israel. After earning their certification (recognized both in Israel and the U.S.), students will have the opportunity to put their skills to use as Hatzalah volunteers. Students who are eligible for Onward Israel scholarships, will enjoy this eight week program for only $500 (including room and board). For Men, please apply to Shapell’s/Darche Noam here and for an Onward Israel scholarship here! For Women, please apply to Midreshet Rachel v’Chaya here and for an Onward Israel scholarship here! Hatzalah Emergency Medical Responder training will include 60 Hours including class and field training hours. At the end of the course the students will need to complete tests successfully, and will then receive a United Hatzalah EMR Certification, National Registry of the United States EMR Certification, PHTLS, and the American Heart Association Certification. Students who complete all of the requirements will join a team that will volunteer on United Hatzalah ambulances around the country. For more information click here! For more information about EMR certification click here! If you have any further questions contact Rabbi Shimshon Nadel, Director of Recruitment rsn@darchenoam.org.